The Comptroller and Auditor General said today he had no oversight over the payment. Aras an Uachtarain in Phoenix Park. THE PUBLIC ACCOUNTS Committee has dealt with confusion surrounding an annual payment of €317,000 that’s been paid to the Office of the President since 1998 that the Comptroller and Auditor General has no oversight over. The payment is made from the central exchequer accounts and Fianna Fáil’s Marc McSharry TD this afternoon described it as “bizarre”. Questions surrounding the payment were raised by McSharry as part of the Public Accounts Committee’s examination of the costs of the Office of the President. The meeting heard that the presidency had direct expenditure of €3.6 million in 2016 but that this increased to €8.2 million when the cost of related items such as security and the maintenance of Áras an Úachtaráin were included. 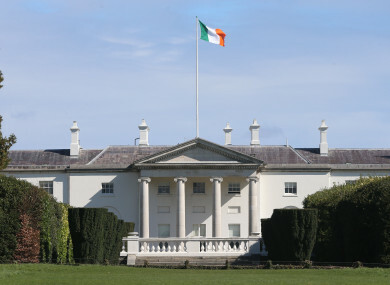 The upkeep of Áras an Uachtaráin for the year was said to cost €2.6 million. The payment of €317,000 was included in the above €8.2 million figure and Comptroller and Auditor General (C&AG) Seamus McCarthy described it as “an allowance” and not connected to the President’s €249,000-a-year salary. McCarthy said that the amount is prescribed for in law but that the law does not dictate what it is used for. McSharry said that he had noticed the figure while researching ahead of today’s meeting and sought clarification on behalf of PAC. “What we have is €317,000 per year, provided for under an act. We don’t know what it’s for, it’s an allowance. We don’t know what’s purpose is for, it could be spent theoretically on anything, it mightn’t be spent at all presumably,” the deputy stated. We want to get to the bottom of the procedures but what we do know is that the Secretary General of the Department of An Taoiseach doesn’t know, the C&AG is not responsible and doesn’t know and the Department of Finance Secretary General doesn’t know, according to yourself C&AG, or doesn’t have a role in auditing that money. Martin Fraser, Secretary General of the Department of An Taoiseach and the Accounting Officer to the Office of the President said that he was equally unaware what it was used for. “I don’t know, but I presume there’s procedures in Áras an Úachtaráin for dealing with it,” Fraser said. When details of the act governing the payment were confirmed in the committee, Fine Gael TD Alan Farrell searched for the relevant law and found that it related to a pension scheme and was introduced in 1998. “That’s here and it relates to pensions, I don’t understand why we’re confused as to what it is. I’m just offering it for information because I was confused as well,” Farrell stated. “The allowance payable from central fund referred to is provided for in the Presidential Establishment Act 1938 and has been available to all Presidents in the last 80 years. The amount has not changed since 1998,” the spokesperson said. This allowance is used to meet additional costs not covered elsewhere in the President’s Vote, for instance costs related to hospitality for the 20,000 people that visit Áras an Uachtaráin each year, State Dinners for visiting Heads of State and for the hundreds of events hosted by the President at Áras an Uachtaráin each year. The timing of the meeting, coming as it does a day before nominations for the presidency close, was described as “unfortunate” by Social Democrats TD Catherine Murphy and was criticised by other members. Despite this, Murphy asked Fraser about the fact that the Office of the President does not come under Freedom of Information legislation. Fraser said that this was due to both policy and constitutional reasons. Article 13.8.1 of the Constitution prevents the President from being “answerable to either House of the Oireachtas or to any court” and Fraser said that because FOI requests are enforced by the courts it would be unconstitutional to include the presidency in FOI legislation. Fraser was also questioned about the fact that an internal audit committee which looks at presidential expenses did not meet until February this year despite being set up in 2014. The civil servant said that this was due to the chairman of that committee being “indisposed” due to personal reasons and that he took the decision not to proceed with the committee’s work without him. Instead, Fraser said that he relied on the annual report of the C&AG. Fraser agreed this situation was “sub-optimal” and said that the audit committee has now met three times since February with a new chairman was in place. Amid a testy exchange with Independent TD Catherine Connolly who sought the exact dates of when the audit committee had met, Connolly asked Fraser: “I don’t know why you’re throwing your eyes up to heaven?”. Fraser responded that he was in fact wincing due to a broken elbow and pointed to his left arm which was in a sling. Email “Confusion reigns in PAC over 'bizarre' €317,000 annual allowance to the President”. Feedback on “Confusion reigns in PAC over 'bizarre' €317,000 annual allowance to the President”.